1. Purple bunny ears - $2 - Real Canadian Superstore. There is nothing cuter than some bunny ears on your little one's, and it's always a fun way for them to dress up for the special occasion. I loved these purple one's and at $2, how can you turn them down? 2. Graduates Juice Treats - All toddlers deserve a special treat on a holiday, but I for one don't want to hop Halle up on chocolate. Instead, some yummy fruit snacks are a great alternative and the light colours of these Graduates treats fit in with the Spring holiday. I picked these up at Real Canadian Superstore, but you should be able to find them at most grocery stores. 3. 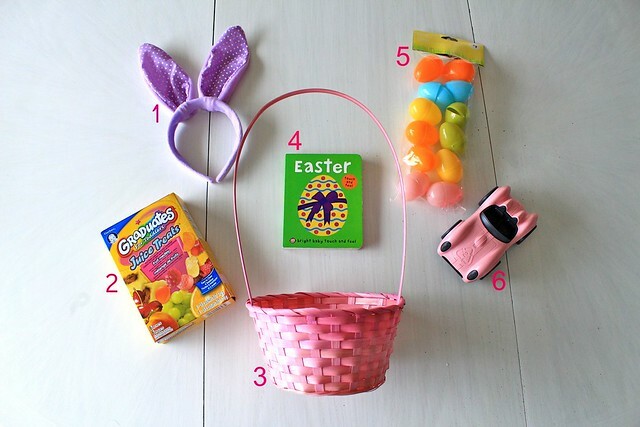 Pink Woven Easter Basket - $1 - Real Canadian Superstore. I always remember having my own yellow basket that we would put out every Easter for the bunny to fill with treats. I wanted Halle to have her own as well, and when I saw that Superstore had these cute one's on for $1, I had to grab one for her. Not too big and not too small, it's the perfect size for a few treats and a little gift or two. 4. Bright Baby Touch and Feel Easter Boardbook - $4.95 - Indigo. Halle loves books, and we love reading to her. It's one of our favourite things to do, especially right before her nap or bed. It was a no brainer that we would want a book to be a part of her Easter basket and these touch and feel books are always a win. 5. Plastic Egg Fillers - $1 - Real Canadian Superstore. Rather than putting juice treats into the basket in their little packaging, why not make them a bit more festive and place them inside these Plastic Egg Fillers? 12 Eggs for $1 - there's no reason not too! 6. Green Toys Race Car in Pink - $9.95 - Indigo. We love Green Toys around here. They are cute, and eco-friendly. When I saw the small pink race car, I knew our vehicle loving toddler would be a fan and the colour worked well in our basket. They also come in red & blue. Easter shouldn't be all about chocolate. I'm most looking forward to special time as a family, and playing with Halle and her new toys. What are some of your favourite Easter memories? What treats do you love the most? Are you a Cream Egg fan, or is your weakness Cadbury Mini Eggs, like me? Spill the beans on your Easter plans, and what would be in your ideal Easter basket. This girl has been MIA, I know. I wish I had a better reason for it, but really, it has just come down to the fact that every time I open up my computer to write... there has been no inspiration at all. I miss it. I really do miss blogging, but it wouldn't feel right to put up a bunch of content that I wasn't passionate and excited about. Life recently has just been full of time with Halle and I love it. We've soaked up the beautiful days with long walks and trips to the park. I've been spending more time in the kitchen discovering new, exciting and healthy meal ideas for our family. Halle has been eating better and that makes us all happy. Unfortunately, the sleep front is a whole other issue. For the longest time she would go to bed between 7:30 and 8:30 and sleep until 9 or 9:30... now she fights bedtime, and then wakes in the middle of the night crying or screaming for me. What started out as teething, I think has become night time separation anxiety. She doesn't even like B putting her to bed if I am home... she howls and it's heart breaking... but we're working on it. Around here - not much has changed, other than we bought Halle a big girl bed. I was going to share a post about the changes in her room... but when I put it together, I really wasn't excited about sharing it. Wedding planning is coming along... but I'm questioning how much I want to share in advance of our big day? Again, my gut is telling me it's not stuff I want to put out there... not quite yet anyway. So yes, I'm here... and I read when I have the chance, but really, the computer and I have been quite distant recently. We need to become reacquainted, and I need to find my passion for writing and sharing again. I know there have to be things happening that I want to share... so in time I know I will come back around... please just be patient friends. I am still here.